Resident Ambassador of the Republic of China (Taiwan) to St. Kitts and Nevis His Excellency George Gow Wei Chiou, and Prime Minister and Minister of National Security the Honourable Dr. Timothy Harris at the ribbon cutting for the CCTV Command Centre. 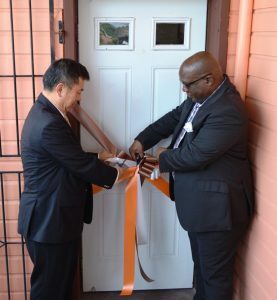 Resident Ambassador of the Republic of China (Taiwan) to St. Kitts and Nevis His Excellency George Gow Wei Chiou, and Prime Minister and Minister of National Security the Honourable Dr. Timothy Harris cut the ribbon to the CCTV Command Centre. BASSETERRE, St. Kitts – The CCTV Command Centre situated at police headquarters in Basseterre was officially handed over to the Ministry of National Security June 29, marking the completion of Phase I of the closed-circuit television (CCTV) project. In a short ceremony, Permanent Secretary in the Ministry of National Security Osmond Petty, stated that this first phase included the installation of more than 300 CCTV cameras, 12 network video recorders, 12 49-inch televisions, six servers and furniture for the command centre. 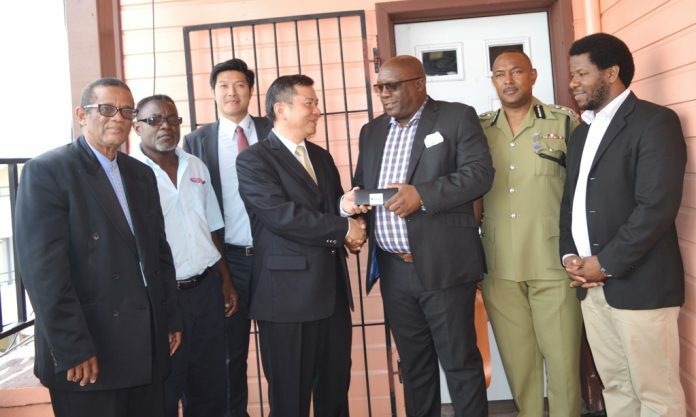 VIVOTEK was described as one of the top five CCTV equipment manufacturers in the world by Resident Ambassador of the Republic of China (Taiwan) to St. Kitts and Nevis His Excellency George Gow Wei Chiou. He also said that the company was the provider of CCTV surveillance systems for Taipei City in Taiwan. Prime Minister and Minister of National Security the Honourable Dr. Timothy Harris and Ambassador Chiou had previously signed a sales agreement for the supply of CCTV equipment by VIVOTEK. The project is a part of the “Cities and Roadways Surveillance System CCTV Project” of which there are two additional phases yet to be implemented. It is being funded through a bilateral agreement for police cooperation signed in 2016 by both countries. 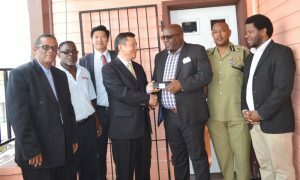 Ambassador Chiou explained that VIVOTEK was recommended by the Taiwan National Police Agency to be the contractor for the St. Kitts and Nevis nation-wide CCTV surveillance system. “After one year of hard work of installation and testing by VIVOTEK Corporation and its partner Secure Guard Ltd. Corporation of this high-tech surveillance system, 300 cameras have been successfully installed,” said Chiou. Prime Minister Harris described the occasion as a “significant and historic achievement,” adding that that phase alone cost in excess of EC$5 million. However, he also said that the government had accepted that the crime situation in the country required innovation and that the introduction of CCTV cameras on both islands was one of the new interventions. He went on to thank the government of the Republic of China (Taiwan) for its commitment to ensuring the safety and security of the people the federation. “Today we have come to celebrate the completion of Phase I of this particular project and to signal our readiness to move, post-haste, with respect to Phase II of the programme,” Harris said. “We have [been] advised that the CCTV…has been quite an added tool in the fight against crime and has assisted the police in providing reliable evidence [with] which they could deal with the investigation and containment of criminal activity.